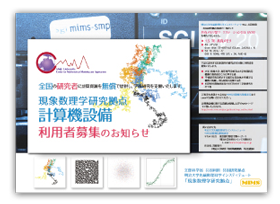 MIMS is providing computer resources with academic researchers in Japan. MIMS SMP consists of four computing serves (mims-smp, mims-cpu1, mims-gpu1, mims-gpu2) and login server (mims-gate). Here is their spec. Please send the following information by email. Also, send "the letter of agreement" (PDF) by email or postal mail. If the information is appropriate, we will send you your account and password by a postal mail. Your personal information is used ONLY for managing MIMS SMP accounts and for informing you on MIMS SMP. Please note that we may refuse your registration if you do not provide us with appropriate information. No fee is needed to use MIMS SMP. Please understand the "guideline of MIND," Meiji University. The MIMS-SMP is NOT an online storage service. Please use it at your own risk and do not forget to backup your files. When you announce or publish your results obtained by using MIMS SMP, please acknowledge it clearly. See below for example. In this work, we used the computer of the MEXT Joint Usage / Research Center "Center for Mathematical Modeling and Applications", Meiji University, Meiji Institute for Advanced Study of Mathematical Sciences (MIMS). If you have any question, please don't hesitate to contact the support room.